This is by no means an exhaustive list. If I included everything, this list would be uncomfortably long to read, awkward to scroll, several of the entries would be behind a paywall, some would be links to games that have been lost to time, and a surprising number would be the confusing work of an enthusiastic yet mostly incapable 11 year old. Instead, this is a short list of some of my better work. They're all games I can share freely without upsetting past or current employers, so they're all projects done in my own time. A more complete list of my creations is available for the curious on my Itch page. If you have any questions about things shown here, or the things I haven't been able to show, don't be afraid to get in touch. Challenge animals to rap battles for the right to roast and eat them. 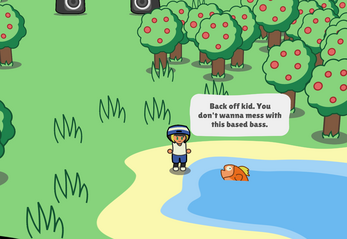 Summon and challenge the Actual Bass God. Three rap battles filled with slick disses, original beats, and funky dance moves. Also a dog. Made solo in 48 hours for Ludum Dare 43, where of 764 entries, it ranked 1st in Audio, 2nd in Humour, 6th Overall, and 7th for Graphics. The World ends. All life is extinct. 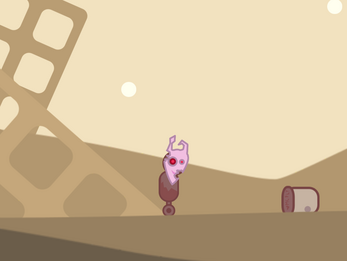 A lonely machine roams the surface, making what friends they can in an empty world. 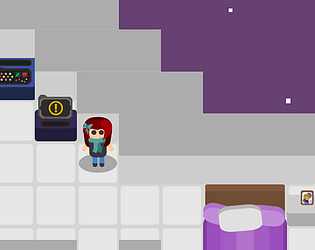 A short narrative game about making friends with inanimate objects that don't do anything. About what you value when nothing is left. Made in 30h for the Jupiter Hadley Jam, winner in the "Game" and "Best Solo Game" categories. 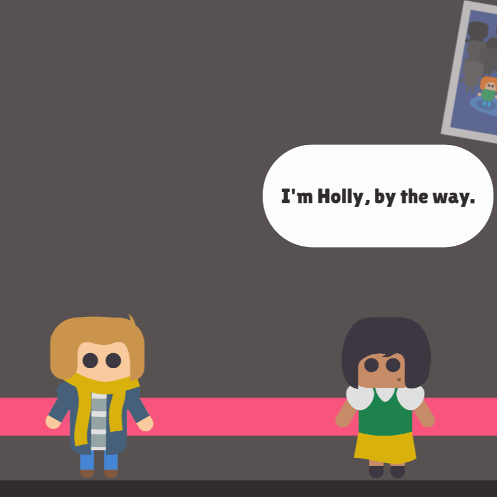 A game about a long distance relationship in space, where messages can take minutes to reach your partner. Play a game on your ship, listen to music, gaze into space. Anything to kill the time before you next hear from your partner. Experience the isolating feeling of talking to someone you care deeply about. Then play your ship's game again, because the replies still aren't coming any faster. Made for Global Game Jam 2018, with the theme "transmission". A minimalistic, hexagonal blend of Snake and Air Traffic Control. Control a collection of snakes, in an age old quest to devour ever respawning pellets. As your snake grows, it will split into multiple smaller snakes. To help you juggle them, snakes can have their paths planned out in advance. Complete objectives, watch as the game field shifts, with the very stage rearranging itself into increasingly treacherous patterns. Shoot for the best score possible! 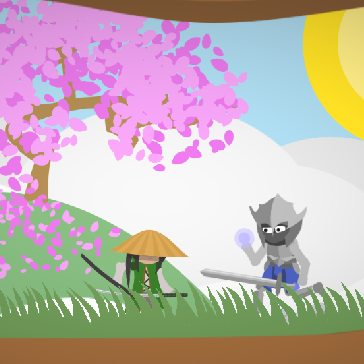 A stylish samurai game about fast thinking and reflexes. Swing your sword to fight foes, deflect projectiles, and launch the dropped swords of your foes, but be cautious! Every successful slash rewards you with no cooldown, restored double jumps, and points, but every miss leaves you defenceless against your enemies! Unlock upgrades for your foes, to raise the stakes, and find a worthy challenge! Developed entirely by myself in the space of two months, save for the sound and music. Created to be a larger scale project, with a focus on tight and rewarding gameplay, an art style different from what I've tried before, and heavily targetting an audience that likes to see themselves improve visibly in games. A personal game about trying to hold a normal conversation while obsessing over whether the other person thinks you are bad. An exploration of a weird kind of anxiety. It should be easy enough, just avoid confessing to your darkest thoughts to someone you met two minutes ago. Don't choose the obviously bad options. Yet the tempation is there, and the possibilty, irrational as it is, is both terrifying and enticing. Made in 8 hours for the Berlin Minijam, with the theme "You are the villain". Built as a public challenge to my own irrational thoughts. 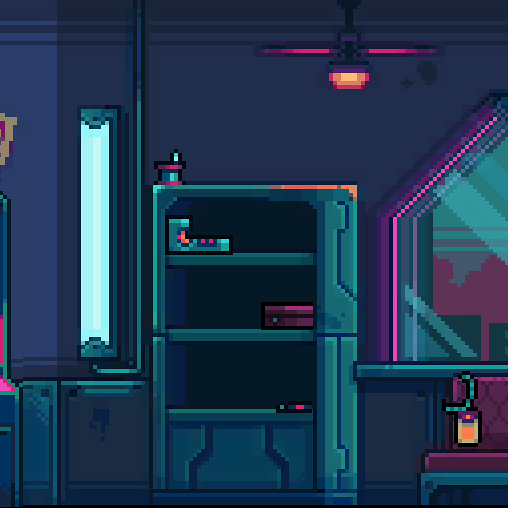 A 5 minute cyberpunk game about arranging items into a limited space. Pack your bag for the last time, before heading out into a oppressive dystopia. You're packing to leave your flat for the last time, as the Enforcers will be arriving soon. What you're packing for is determined by what you choose to pack. Are you fleeing to make a new home elsewhere? Or are you planning to resist the very people who've forced you out? Created as part of a team of three, within two weeks, for #ResistJam. My personal goal within the jam was to give a person from a disadvantaged background a chance to design a game. My role was project management, coding, and assembling all the assets from various team members into something which matched the designer's specification. If you want to talk about anything, hit me up with an email!